Ponchos have come a long way since the 1970s. No longer made from scratchy acrylic and in outlandish patterns, they are now an essential part of any woman’s wardrobe - the perfect piece to throw on over your outfit on those crisp fall days, when a coat is just too much. 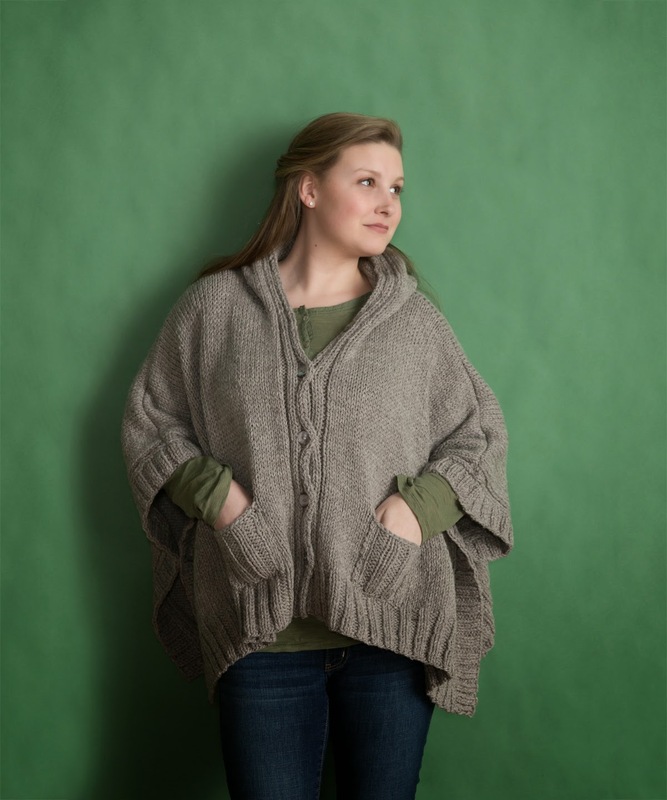 Fosston, from our Classic Fall collection, is a great example of the evolution of the poncho. It has everything a girl could ever want – pockets, a hood and a button front. I have a deep love for pockets in knitwear, especially if it is outerwear. I hate carrying a bag unless I absolutely have to, which means I need to have a place to store some cash, my debit card and a phone. Hoods are another essential part of any good poncho. Whether you wear it around your shoulders or up over your head, it serves as an extra layer of warmth at those Friday Night Football games or when the wind picks up while shopping at the Farmer’s Market. Not to mention that a poncho without a hood just seems wrong somehow. I think the best part of this poncho is how easy it is to wear. 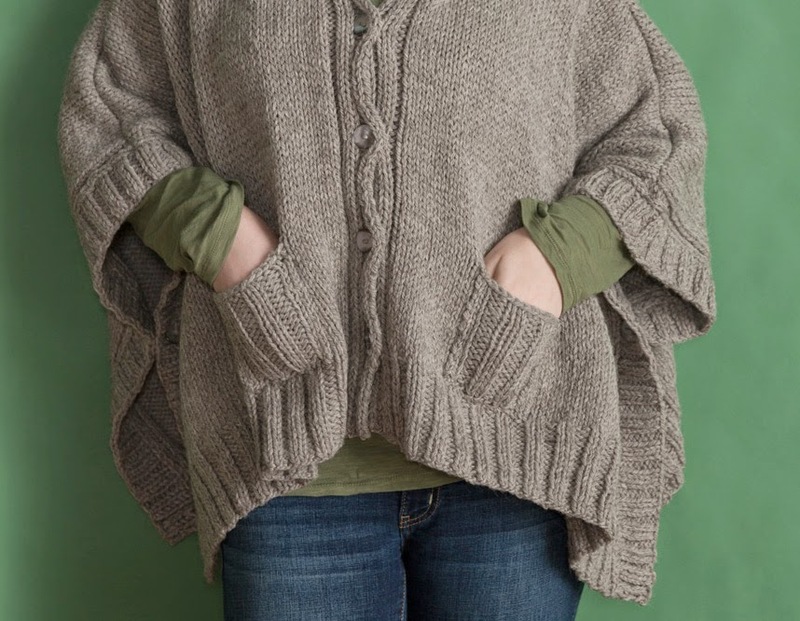 It’s very roomy – perfect for layering over outfits – and buttons up the front and along the sides. No more pulling a your knitwear over your head and messing up your hair. Just slip it on, button it up and go! 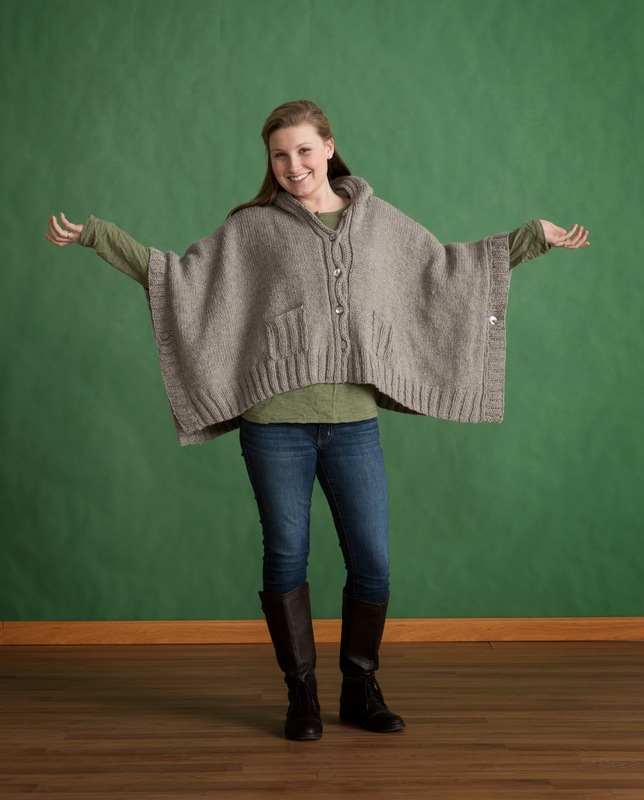 Knit in Blackthorn or Wynter on size 10 ½ needles, this poncho will fly off your needles in no time. There is minimal shaping and very little finishing once the pieces are bound off. An extremely flexible piece, it looks great over jeans, but also try it with pants and skirts. Throw it on as you are running out the door for pumpkin picking, a hayride or a fall fiber festival (can you tell we love fall in New England?). Whatever you do, don’t throw it in the back of your closet once winter arrives. Keep it handy to use as a wrap instead of a blanket while knitting, reading or even watching TV. Or stash it at the office for when you and your co-workers are disagreeing about where to set the thermostat. This design and many more are featured in the book Classic Fall which available at LYSs now. Run over and pick up your copy today!